Whether you are visiting Oklahoma for a long vacation or are starting a new life there, having your car is essential to your stay. By having your car with you, you will be able to have a reliable form of transportation to explore the state. Although it may seem like a good idea to drive to your destination, auto transport is a better solution. This method of transport is fast and inexpensive. With this service, your car will be loaded onto a car carrier, capable of hauling up to nine vehicles. The car carrier is open-air, so your vehicle will be exposed to some of the elements of the road and weather. Read more on open auto shipping. This service is similar to open auto transport. Instead of being on an open-air car carrier, your vehicle will be shipped via an enclosed carrier. We highly suggest this option for anyone who is shipping a vehicle that is high in value, such as a classic, luxury, sport, or exotic model. Read more on enclosed auto shipping. If you are on the search for a specific make and model of vehicle and the closest one is far away, consider using our services. Once the dealerships have agreed to the trade, National Dispatch can deliver the vehicle to you. This saves you the hassle of trying to get to the dealership, that has your new car, and figuring out how to get back. You could have your dream car without having to travel. Read more on shipping a car out of state. Did participate in a car auction? Are you a buyer or a seller? No matter if you bought or sold a car via an auto auction, we can help. We will transport the vehicle from the buyer to the seller without a hitch. The safety of your vehicle is our top priority. Read more on auction auto shipping. Once you have used our auto transport services to ship your vehicle, be sure to enjoy Oklahoma. The state has many things to offer and appeals to just about everyone. Below, you will find a few different places to help get your exploration started. Located in Edmond, the Armstrong Auditorium aims to bring the arts to life by creating monumental cultural experiences. The auditorium is located on the campus of Herbert W. Armstrong College and has hosted some of the world’s best classic, jazz, and folk musicians and dancers. Each year, they have a great selection of performances to see. The performances range in ballets, folk dancing, choirs, single instrument performances, and orchestras. Woolaroc, located in Bartlesville, is a beautifully unique experience. The name Woolaroc comes from three words that make up the property which are woods, lakes, and rocks. The 3,700 acre land started as a ranch where Frank Phillips, an oilman, could relax. Today it has become a preserve to protect many wildlife species and to share its beauty. These include elk, cattle, donkeys, goats, deer, llamas, ostriches, and buffalo. The museum is home to many western artifacts, Native American materials, colt firearms, and more. Phillips stated that too often, Americans are caught up in a fast past world where too much time and money are spent on things that do not matter. At the ranch, he was able to get back to nature and enjoy life. This has become the mission of Woolaroc. The Oklahoma Aquarium, located in Jenks, aims to teach its guests about the aquatic world through an interactive experience and to inspire conservation of aquatic life. The aquarium is a non-profit organization. Therefore, all the money that it gets from admission, memberships, and events goes back into the aquarium’s exhibits and educational programs. It allows people to book certain rooms or the whole facility to host events such as birthdays, weddings, and corporate events. The aquarium has one of the largest collections of bull sharks for viewing in their shark adventure exhibit. The best part is you do not even have to get wet. Their newest exhibit is Sea Turtle Island. At this exhibit, you will see two 300 pound sea turtles, reef sharks, and tropical fish. The 56,000 gallon tank can be seen by any of the three viewing levels including an underwater observation station. If fish are not your thing, the aquarium also offers an exhibit with otters, beavers, and raccoons. This indoor waterpark, located in Clinton, is a warm 85 degrees all year long. Even in the middle of winter, you can enjoy your favorite summer activities. The water park offers over 500 feet of water slides. This includes slideboarding, the newest innovative technology in water slides. Slideboarding is an interactive video game while you slide. You have controllers. While you slide down, you will see lights above you. You then hit the color button on your controller that matches the colors that you see. This is a great way to be active and competitive while playing a video game. During your stay, you will also be able to enjoy the lazy river, wave pool, cub’s cove (for your little ones), and activity pool complete with basketball hoops. 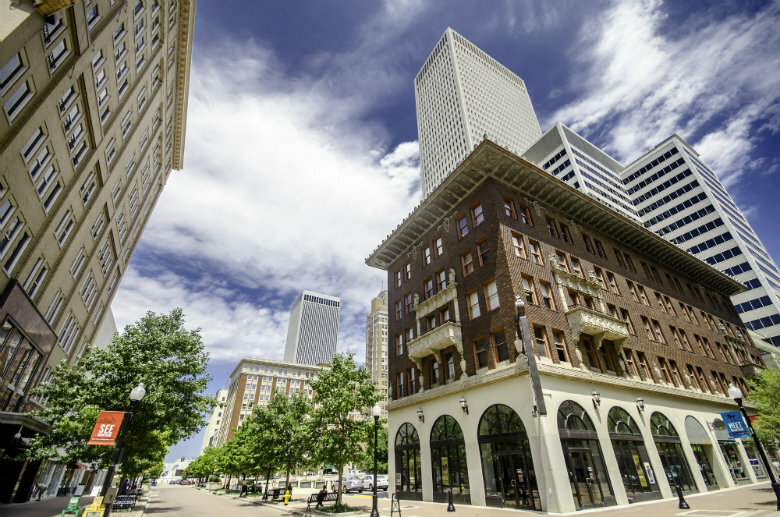 Oklahoma City has a lot to offer visitors and residents, in terms of attractions. Bricktown used to be a bustling warehouse district, but now, it has everything to settle your entertainment needs. The best modes of transportation in Oklahoma City are by foot, taxi, or horse drawn carriage. The area is very popular and driving your own vehicle can be tricky. Plus, by walking, using a taxi and riding in a carriage give you ample time to look at the sites and people watch. You will also see all the murals, sculptures, and performance art while exploring the streets. Bricktown is best known for its nightlife. There are several nightclubs, restaurants, and shopping areas for anyone to enjoy. The area also has a movie theater, a baseball park, and a Bass Pro shop Outdoor World store. Are you in need of auto transport services to or from Oklahoma? Contact National Dispatch, today. Use our easy-to-use quote calculator to receive a free, instant quote. No personal information is required. You can also call us at 800-321-2051.